The SS United States is sending out what may be its final distress call. Colin Farrell is seen aboard the famous ship. Left) Colin Farrell heads down rusting First Class promenade of the SS UNITED STATES; (Right) The First Class promenade deck during the heyday of trans-Atlantic travel aboard the SS UNITED STATES… when deluxe passengers enjoyed early morning bullion and afternoon tea while watching the Atlantic on their way to and from Europe in only 4 days at sea. The 990-foot-long SS UNITED STATES could be sold for scrap within two months unless the grass-roots preservation group that’s working to secure a home and purpose for it can raise $500,000 immediately, the group told The Associated Press. Talks are under way with developers and investors about the ship’s long-term future, but without the emergency funding, its caretakers fear they will run out of money before a deal is inked. 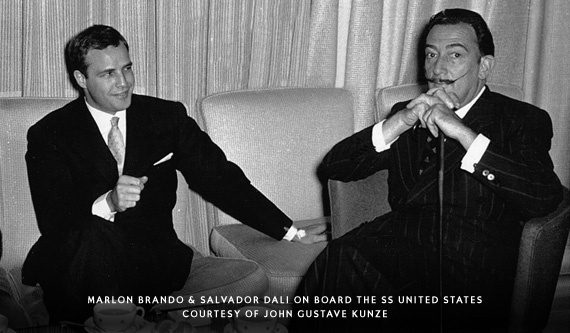 Here are great photos when stars and celebrities sailed aboard the fastest ocean-liner in the world. The historic ocean liner carried princes and presidents across the Atlantic in the 1950s and 1960s but has spent decades awaiting a savior at its berth on the Philadelphia waterfront. 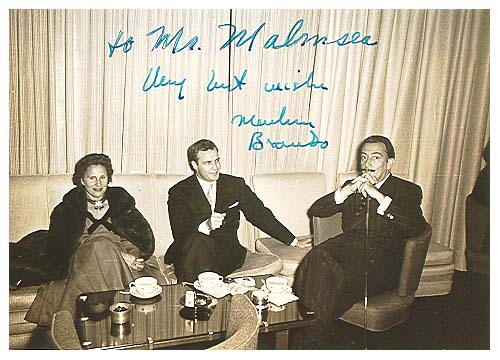 Marlon Brando and Salvidor Dali enjoying after dinner coffee in the First Class Lounge of the SS United States. 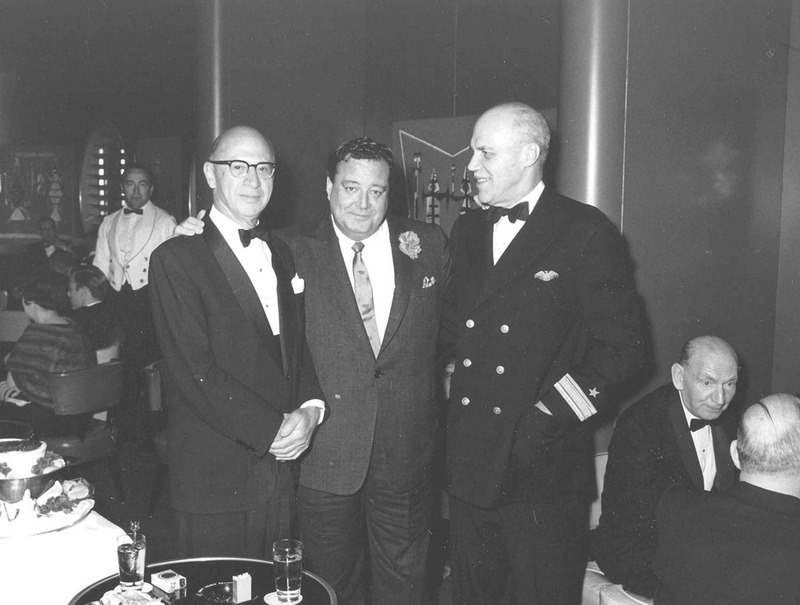 It’s Captain’s Dinner aboard the SS United States in 1956 in the First Class Dining Room. And this is the one night Judy Garland left her stateroom. 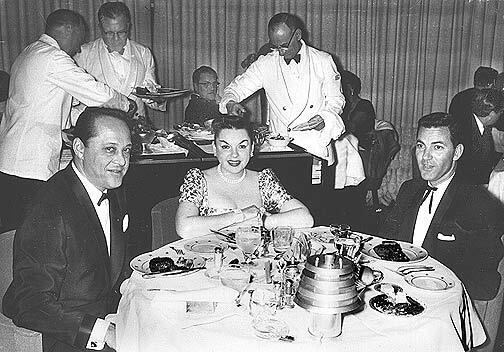 Pictured: Producer Sid Luff and his wife Judy Garland with friend John Carlyle (and number one fan) at right. On April 23, 2012 in Philadelphia, principal photography began aboard the SS United States for “Dead Man Down”, a major motion picture from IM Global. The film stars Colin Farrell, Noomi Rapace, Terrence Howard, and Dominic Cooper. The Philadelphia shoot will continue into June. The director of the film is Niels Arden Oplev, who directed the original 2009 Swedish language version of “The Girl with the Dragon Tatoo”, which starred Ms. Rapace as Lisbeth Salander. Niels Sejer is Production Designer for the film. 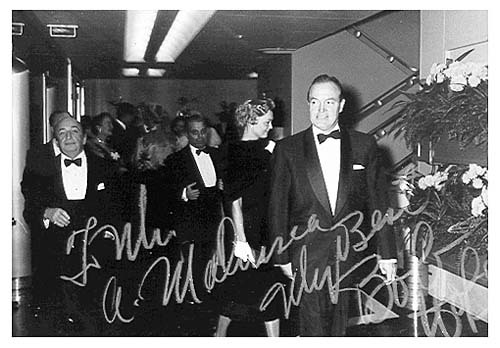 The SS United States Conservancy served as host to the film company and crew on its first day of shooting. A press conference was held to celebrate the event with the ship serving as a fitting backdrop. Participants included Sharon Pinkenson, Executive Director of the Greater Philadelphia Film Office (www.film.org), Philadelphia Mayor Michael Nutter, “Dead Man Down” Co-Executive Producer Joseph Zolfo, SS United States Conservancy Executive Director Susan Gibbs (www.ssusc.org), and SS United States Redevelopment Project Executive Director Dan McSweeney (www.ssusc.org/redevelopment). “SS United States” song written and performed by Philly’s own Skip Denenberg & Andy Kravitz. Produced by Andy Kravitz. COMING IN 2012: “Dead Man Down”, a film by Neils Arden Oplev COMING SOON: “SS United States: Made In America”, a film by Robert Radler. 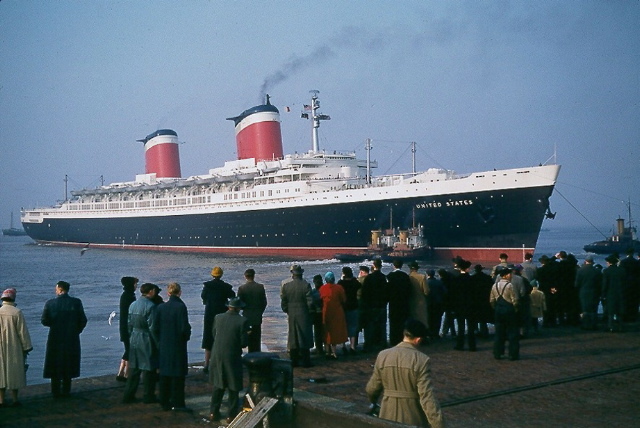 The S.S. United States arriving at Bremerhaven Columbus Bahnhof – Germany. This dreamlike photo of the S.S. United States is a wonderful composition and gives the viewer a sense of the close relationship the people of Bremerhaven had with the shipping industry and its sea going passengers. The SS United States (also known as “The Big U”) is an ocean liner built in 1952 for the United States Lines. At 53,329 gross tons, she is the largest ocean liner to date built entirely in the United States and still holds the record for the fastest westbound transatlantic crossing. The fastest way to cross! 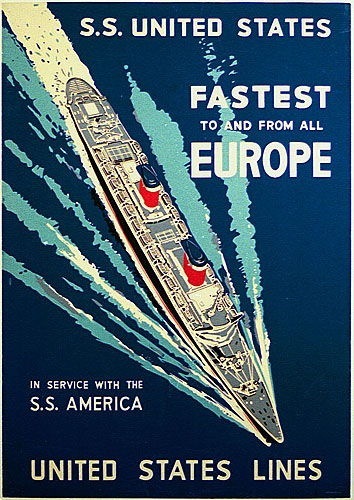 In 1952, on her maiden voyage as the new flagship of the United States Lines, the United States captured the Blue Riband with the fastest eastbound and westbound transatlantic crossings on record. The entry of the United States marked the first time a U.S.-flagged ship held the Blue Riband, surpassing European speed records which had stood for decades.The United States lost the eastbound record in 1990, but still holds the westbound record. The United States plied the transatlantic with passenger service until 1969, and she outlasted the demise of her original owners. 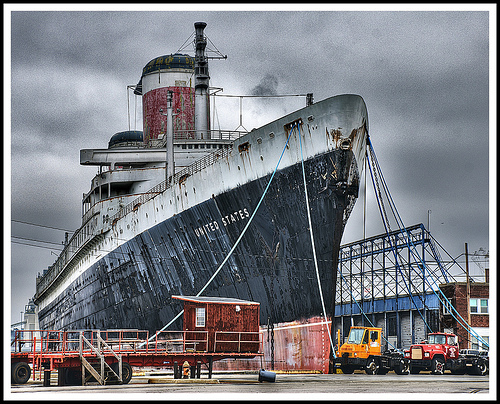 SS United States “waiting” at Philadelphia – December 2007. Since 1969, the United States has not been in service. She has bounced around the world with promises of service from owner to owner. The ship is currently docked in Philadelphia until a decision is made about her fate which does not look good. Previous: SUPREME COURT JUDGES RULE “PUBLIC AIRWAVES” ARE OWNED BY DISNEY, NBC, CBS, ABC AND FOX.